[CONSTITUTION]. Newspaper. 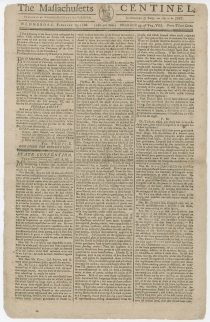 Massachusetts Centinel, February 13, 1788 (Volume VIII, pp. 171-174). Boston: Benjamin Russell. 4 pp., 9⅝ x 14⅞ in. 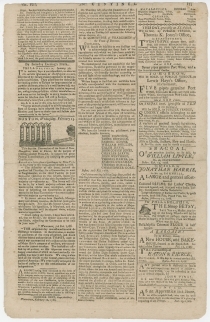 The Massachusetts Centinel employed the Federal Pillars political imagery to announce the ratification of the Constitution by successive states. In this issue, the Centinel announces the pending ratification by New Hampshire. 73 Blacksmiths; 43 Shipwrights; 75 Rope-makers with part of a rope-walk on a sled and martial music; 30 Mast-makers; 36 Sail-makers; 34 Ship-joiners; 30 Block-makers (pulley makers); 6 Mathematical Instrument Makers (makers of navigation equipment, etc. ); 53 Coopers; 20 Boat-builders; 6 Pewterers; 40 Bakers, 50 Shoe-makers; 56 Taylors; 26 Hatters; 20 Ship-builders; 136 Carpenters; 70 Masons; 30 Wheelwrights; 15 Printers; as well as a dozen other tradegroups such Bookbinders; Goldsmiths and Jewelers, Saddlers, Tobacconists, Tanners, Curriers, Leather-dressers, Cabinetmakers, Carvers, Painters, Tinsmiths, Coppersmiths, and 250 of the “principal merchants in the town.” Toward the middle of this assemblage, thirteen horses pulled the ship “FEDERAL CONSTITUTION” manned by a crew of thirteen. A subtext of much of this was an emphasis on domestic manufactures as well as a celebration of Boston’s power and potential in maritime trade. At this event, “WE THE PEOPLE” of Boston “in GRAND PROCESSION MOVING” passed an ordinance to rename Long Lane as Federal Street, in commemoration of the site where the convention had sat. The ordinance concluded, “GIVEN under our auspices…the FIRST YEAR of OUR real, political, federal existence…GOD SPEED THE CONSTITUTION!” (p1/c1). That night, a long boat called “the Old Confederation,” which had been exhibited during the parade, was drawn to the Common and condemned “as unfit for any further service.” The boat was immediately burned “in presence of an applauding concourse of citizens” (p3/c2). On December 26, 1787, Benjamin Russell of The Massachusetts Centinel used the metaphor of pillars in “a great federal superstructure” to describe the ratification of the Constitution by three states. On January 16, 1788, he began to illustrate this metaphor with erect pillars representing the ratifying states. The Massachusetts Centinel’s enthusiasm was premature. Although the Convention in New Hampshire began meeting on February 13, 1788, it adjourned on February 22 without ratification. New Hampshire did not ratify the Constitution until June 21. In the meantime, both Maryland and South Carolina ratified, making New Hampshire the ninth and decisive state to ratify. With New Hampshire’s ratification, the necessary two-thirds of the states had ratified the document, making it the supreme law of the United States. Virginia ratified four days after New Hampshire, and New York the following month. North Carolina ratified the Constitution in November 1789, and Rhode Island in May 1790. 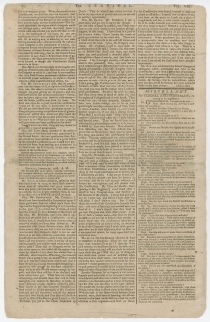 This issue of The Massachusetts Centinel also includes additional proceedings of the state ratifying convention (p1/c1-p2/c3); and news that the New York Assembly and Senate had voted for a convention to consider the Constitution (p3/c1). 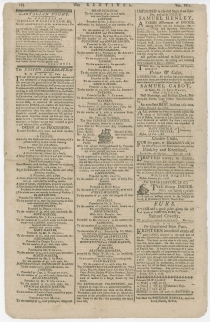 The Massachusetts Centinel (1784-1790) began as The Massachusetts Centinel, and the Republican Journal in March 1784 as a semiweekly newspaper in Boston. The publishers were William Warden (1761-1786) and Benjamin Russell (1761-1845). In October, they shortened the title to The Massachusetts Centinel. 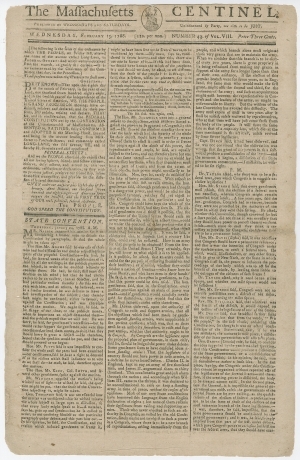 After Warden’s death, Russell continued to publish the newspaper for the next forty years under different titles, including Columbian Centinel (1790-1799), Columbian Centinel & Massachusetts Federalist (1799-1804), and Columbian Centinel (1804-1840). Georgia ratified the constitution on January 2, followed by Connecticut on January 9, but word of Georgia’s action did not reach Boston until later. The illustrations placed Georgia in the proper chronological order as the fourth pillar.